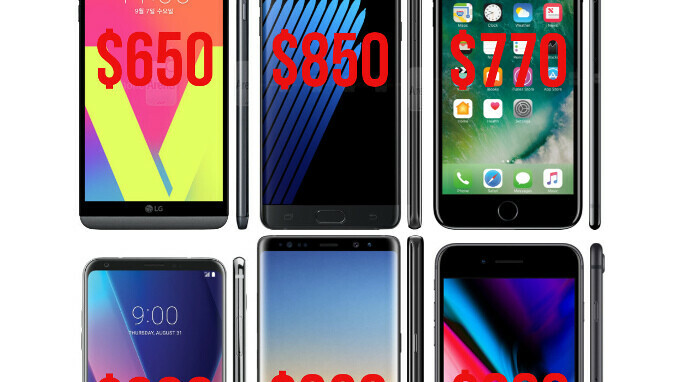 Ever since smartphone subsidies were removed by carriers, we've seen a much more pronounced rise in flagship phone prices, until we reached "the year of the $1000 phone" with the iPhone X or Note 8. Not only has the concept of the $400 flagship gone the way of the dodo bird, as Chinese makers have also increased their starting tags, but there's never been a launch price increase for high-end handsets as drastic as last year. As if to confirm this observation, research firm GfK ran the numbers, now that 2017 is behind us, and made the record increase in phones' average selling price (ASP) official. It turns out that the ASP increased a full 10% year-on-year, to $363, while the number of phones sold globally increased just 1%. The ASP increase was less drastic in North America, but places like China and Eastern Europe bore the brunt of it. Retail prices for high-end phones from the big three brands in the US - Apple, Samsung and LG - have been steadily rising from the very beginning of the race when the OG iPhone was introduced to our unsuspecting wallets, as you can grasp from the last chart below. That one was $500 at launch, but now the iPhone 8 starts at $700, and you are left with a dollar. The first Samsung Galaxy was also priced $500, while last year's Galaxy S8 blasted off at the shameful $750. When we add expensive, but popular outliers like the Note 8 or iPhone X, we can easily explain the record average phone pricing increase registered last year. As you can see in the slides below, every major phone's successor last year was more expensive than the previous edition, sometimes drastically so, raising the average year-on-year price significantly, to the highest ever. We aren't even including Google's own phone line, which used to be the best value-for-money before the search giant decided to vertically integrate, and we are now left with a Pixel 2 XL that costs north of a thousand euros, for instance. There are plenty of reasons which can be cited for that jump, and corporate greed is not even highest on the list - 2017 phones got drastically overhauled in terms of design and materials used, 18:9 HDR displays became obligatory, and the basic storage amounts got bumped. Still, we hope that this unpleasant trend of ever-rising smartphone prices doesn't continue this year, as people are already at the limit they are willing to spend on a handset. They've all realized that they can't get people to keep upgrading phones without the heavy subsidies of the past. So they intend to milk the top tier as much as they can. Which makes sense, since those are the people willing to pay a premium to surf Facebook and browse the web. In all honesty the vast majority of smartphones sold are mid and low end smartphones. That is the vast majority of Androids bread and butter. Apple has a different story and out of the 1.46 billion sold (still need to see Q4 smartphone numbers), Apple has slightly over 2X0 million iPhones to Androids 1.2X billion or more smartphones for 2017. Paid €520 for my xz premium when it came out. Got it off a guy who knew a guy who knew a guy who worked for Sony. Paying almost double that for a phone that does nearly the same thing is insane. If you pay nearly €1000 for a phone you're just doing it so you can tell people you spent nearly €1000 on a phone..
As the old adage goes "There's a sucker born every minute"
If I want to spend $1000 on a phone, I'll just make sure it does have everything I ever need; ergo iPhone X is a joke to me. The Note 8 is easily worth $930, and I mean easily. It does it all, has great battery life, and that heavenly S-Pen mannnnnnnn. I think it's worth more than the competition no doubt, and it's a one of a kind beast, but no phone is really worth that price IMO. The Note line costs $200 more than it did a couple years ago. It was always the top of the line. you got to remember tho, components are getting more expensive as time goes on too, granted the inflation has been a little steeper than it probably should be. things will continue to get more expensive as the cost of the parts to make them goes up. but apple did set a bit of a consumer unfriendly precedent with the pricing of the iphone x because the whole industry tends to follow suit with what apple and samsung do.